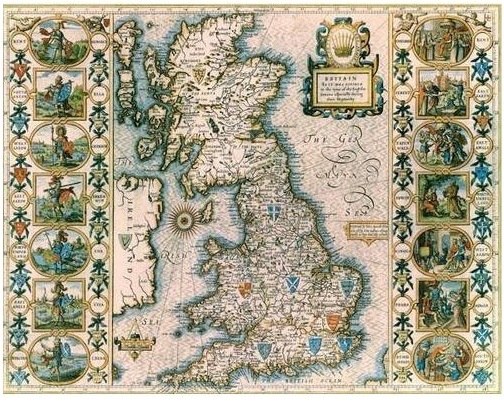 Along with emblems for Essex and Sussex, the Kent horse was were notably featured in the celebrated county atlas produced by John Speed in 1611 on a map depicting the Anglo-Saxon kingdoms. Long believed to have been based on a local tradition, referencing local tales of a white horse symbol used by the possibly mythical founders of the Kent kingdom, Hengist and Horsa, recent research indicates that the association of the symbol with these founding fathers, was in fact a mediaeval creation in northern Germany. The device was subsequently adopted by the Hanoverian royal house whose ascendancy to the British throne occasioned great usage of the emblem in Kent, which had been linked to it since Speed’s map. This emblem has thus been associated with the county for several centuries and long before the establishment of local government. The council later established to administer Kent was accordingly granted arms incorporating the ancient white horse but having thus existed before the origin of the county council, the arms could not be restricted to its use alone and citizens of Kent have always been free to bear a flag with this ancient white horse. The flag was duly included in the Flag Institute’s registry upon its creation, as a “traditional” design.